I grew up in what many would call the ghetto. Not only were we poor, but we lived next door to the neighborhood drug house. My name is Mario, I am 15-years-old, I’m currently a sophomore at Texans Can Academies and this is my story. Having that house beside us, made a poor neighborhood, dangerous. I witnessed drive-by shootings, people being shot, drug overdoses and our house was robbed frequently. As a kid, I could not even play outside because there were always guns. One time, I remember that during a police raid, they used a flash grenade and I was outside and it hurt my ears. My dad had to come get me and carry me inside. It was very painful. Living next to a drug house gave me many opportunities to use drugs, but I had made the choice early on to never take anything. I had watched my brother go down that path and I saw how hard it made things for him. I knew that I wanted more for my life and that I could do better. We eventually moved and I started high school at South Oak Cliff. I was doing well, but was struggling to pass the TSI test. My goal is to join the infantry directly after graduation and pursue a career in the military. I knew that I would need to pass the ASVAB for military entrance and if I was struggling to pass the TSI, the ASVAB would be even harder. My sister, who also graduated from Texans Can, told me about the school and the focused help I would receive here. Now I am currently working hard to gain the knowledge needed to successfully pass the TSI so I can move forward. I am also working closely with my advisor and the career transition coordinator to get assistance with the ASVAB and will take it towards the end of my second year. I came from the ghetto, but I will not remain in the ghetto. Though my journey is just beginning I can already tell the difference in the students and staff at Texans Can. With the help from my teachers and others I will not only graduate, but I am set to graduate early. I am excited for this and have big plans for myself, my life, and my service in the military. 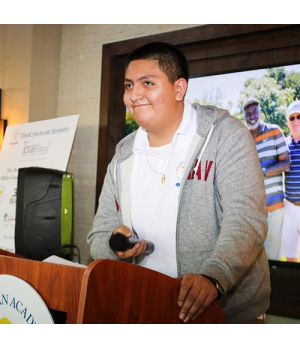 The support people give to Texans Can helps give hope and impacts the lives of kids just like me. My name is Mario and I am set to be a Texan Can graduate in June 2019.